Katinka Hosszu earned Female Swimmer of the Meet honors in Windsor after an incredible seven gold, nine medal performance. Watch Simonas Bilis discuss his victory in the men’s 100 freestyle. The Russian team of Grigory Tarasevich, Oleg Kostin, Daniil Pakhomov, and Aleksei Brianskii slipped into the top seed this morning in the men’s 200 medley relay by topping the second heat of prelims with 1:33.25. Belarus’s Pavel Sankovich, Ilya Shymanovich, Yauhen Tsurkin, and Anton Latkin formed a bit of a surprise second seed team this morning, with 1:33.48, boosted by a big performance by Shymanovich. 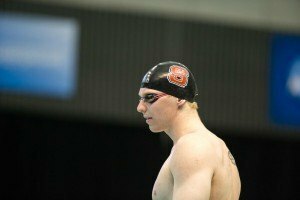 He was the second-quickest breaststroker in the field with a 25.92 split (only Johannes Skagius of Sweden was faster with 25.78). Also pivotal in their swim was national record holder Sankovich, who took the early lead with 23.32 to head the field in the backstroke leg. China’s Xu Jiayu, Yan Zibei, Li Zhuhao, and Yu Hexin grabbed third with 1:33.95, followed by Japan’s Junya Koga, Yoshiki Yamanaka, Takeshi Kawamoto, and Kenta Ito with 1:34.01. Australia’s Bobby Hurley, Tommy Sucipto, David Morgan, and Brayden McCarthy grabbed fifth with 1:34.24, followed by the American team of Matthew Josa, last night’s 100 IM champion Michael Andrew, Tom Shields, and Paul Powers. Lithuania grabbed seventh, despite having the fastest freestyle leg in the field from Simonas Bilis (20.80), and Sweden was eighth. The women’s 200 IM saw a couple of strong performances from the Japanese team in heats three and four. In heat three, Yui Ohashi held off Hungary’s Zsuzsanna Jakobos of Hungary to post 2:08.24. In heat four, Miho Teramura fought with American SCY record-holder Ella Eastin throughout, eventually hitting in with 2:08.14 and falling to Eastin’s 2:07.65. 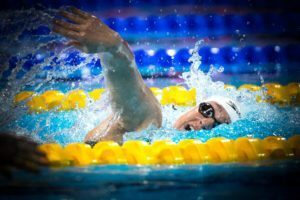 The final heat saw a battle among Katinka Hosszu of Hungary, Longhorn Madisyn Cox of the USA, and Emily Seebohm of Australia. Hosszu topped the field by a second and a half with 2:05.33, followed by Cox in 2:06.72, and Seebohm in 2:08.30. Canada’s Sarah Darcel also made the top eight this morning with 2:08.84. Missing the final were Vien Nguyen of Vietnam (2:10.69) and Hannah Miley of Great Britain (2:09.22). There were a pair of no shows in heat five from Mireia Belmonte of Spain, presumably not quite recovered from her bronchitis, and Jenna Laukkanen of Finland. Hungary, Great Britain, Japan, and the USA qualified two men apiece in the men’s 400 IM this morning, with Great Britain’s Olympic fourth-place finisher Max Litchfield heading up the group with 4:03.56. Litchfield will chase down the British record tonight, a 4:01.63 set by Joseph Roebuck in 2009. Challenging Litchfield will be Hungarian mainstay David Verraszto, who finished in 4:04.43 this morning. Next up this morning were the pair of Americans, Cal’s Olympic silver medalist in the 200 breast Josh Prenot with 4:04.43, and Stanford freshman and Abrahm Devine with 4:04.64 in his first senior international championships. Hungary’s Gyurta Gergely grabbed fifth with 4:04.88, followed by defending champion Daiya Seto of Japan with $:05.00 and his teammate Takeharu Fujimori with 4:05.83. The Brits bookended the top eight; Mark Szaranek finished eighth with 4:06.07. Junior world record holding Olympian Brandonn Almeida of Brazil missed the final by just .02 seconds with 4:06.09. American record holder Kelsi Worrell put up a 56.11 to dominate the field in this morning’s prelims, coming in .64 seconds ahead of the field and .69 off her own American record. The next two swimmers going into semis tonight were Katerine Savard of Canada and Japan’s age-group wonder Rikako Ikee. Savard outtouched Ikee to win heat 5 to a roar from her own crowd, putting up 56.75 to Ikee’s 56.83. Tonight and tomorrow, Ikee will be chasing down her own junior world record of 58.24 from the Tokyo World Cup in October. 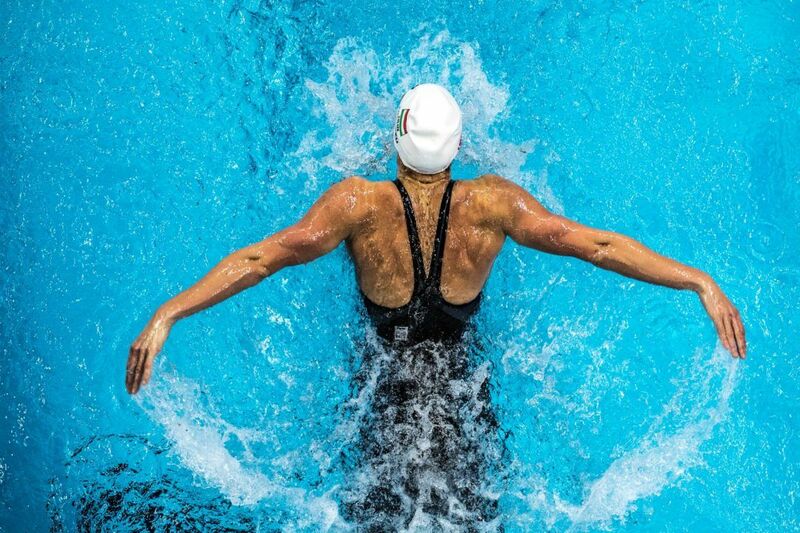 Hungary’s Iron Lady Katinka Hosszu held back until the final wall of the women’s 100 fly, when she kicked it in to chase down American Sarah Gibson out of Texas A&M in the penultimate heat. The pair ended up fourth (56.99), and sixth (57.20), respectively. Coming in between the two in this morning’s results was Brazilian Olympian Daiene Dias with 57.17. Lu Ying of China, the fourth seed coming into the morning, was a no show in the event. 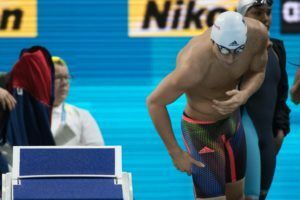 In a surprising turn of events, Vladimir Morozov of Russia, Chad le Clos of South Africa, and Adam Timmers of Great Britain all failed to qualify for the semifinals of the men’s 100 free. 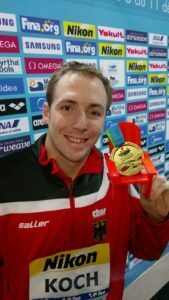 Morozov is the 6th-fastest swimmer in the history of this event, and le Clos also sits in the top 20 all-time performers. This morning, Morozov posted 47.82, le Clos swam 48.31, and Timmers hit in 48.15. Interestingly, Oussama Sahnoune of Algeria grabbed a surprise heat win in the top circle-seeded heat with 47.70. However, his win in the final heat only placed him 13th overall. Instead, American Olympic relay gold medalist Blake Pieroni posted the fastest time this morning with 46.76, followed by Yuri Kisil of Canada with 46.79. The pair were the only two under 47. France’s Metella Mehdy was third with 47.13. Park Tae Hwan set a new South Korean record with 47.19. Also setting a national record was Finland’s Matias Koski by just one one-hundredth of a second, taking down the previous 47.56 with 47.55 to qualify ninth. American Michael Chadwick, fresh off a relay anchor leg that brought the USA to mixed 200 medley gold on Thursday, qualified 11th with 47.60. The women’s 50 freestyle could be anyone’s game tonight and tomorrow, with just half a second separating first from sixteenth. The pair of four-time Olympian Jeannette Ottesen of Denmark and Michelle Williams of Canada held the top slots this morning, posting 24.03 and 24.04 in the pool this morning. Erika Ferraioli of Italy grabbed the third seed going into tonight with 24.11, tied with 2012 Olympic champion in both the 50 and 100 freestyle Ranomi Kromowidjojo. Kromowidjojo had an underwhelming Olympic performance in Rio, but it was recently revealed that her back injury just before Rio was worse than she and her coach had previously let on. Also in the packed field tonight will be Silvia di Pietro of Italy (24.21), Menghui Zhu of China (24.30), Etiene Medeiros of Brazil (24.31), and Brittany Elmslie of Australia (24.33). Age group wonder Rikako Ikee, in the midst of a packed event schedule, also made the semifinals tonight, in a tie with American Madison Kennedy and Australian Emily Seebohm for 12th with 24.49. This race was a no show for Belarus’s 2012 Olympic silver medalist in both the 50 and 100 free Aliaksandra Herasimenia. Like the women’s 50 free, the men’s 50 breaststroke came in a tight margin this morning, with about half a second separating first from sixteenth. Kirill Prigoda of South Africa came in just ahead of Brazil’s Felipe Lima, posting 26.23 to Lima’s 26.26. Slovenia’s Peter Stevens also hit in the top three, swimming the prelim in 26.33. Close behind was American Olympic bronze medalist in the 100 breaststroke Cody Miller with 26.34, followed by defending world champion Felipe Franca Silva of Brazil in 26.44. World record holder Cameron van der Burgh finished sixth with 26.55, followed by last night’s 100 IM world champion Michael Andrew in 26.56. The American team of NCAA standouts destroyed the field in the 800 free relay, as Mallory Comerford, Sarah Gibson, Katie Drabot, and Leah Smith came together for 7:41.25, a full five seconds ahead of second-place China. 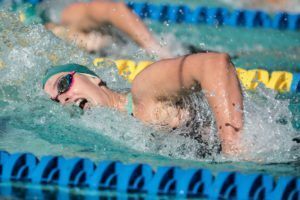 The Louisville star Comerford posted the quickest time of the swimmers in the event with 1:54.63, which was particularly impressive since she was the lead-off swimmer. Even though Smith is the only swimmer of the group who contributed to the U.S.’s gold medal 800 free relay in Rio, the American mid-distance dominance goes far down the roster of talent, and it should be an easy win for the team tonight. China’s Zhang Yuhan, Al Yanhan, Dong Jie, and Shen Duo finished second with 7:46.25, followed by Canada’s Kennedy Goss, Alexia Zevnik, Taylor Ruck, and Penny Oleksiak in 7:46.33. Russia’s Daria Mullakaeva, Irina Krivonogova, Daria Ustinova, and Arina Openysheva were very close behind with 7:46.39. To no one’s surprise, Italy’s world record holder and Rio Olympic gold medalist Gregorio Paltrinieri posted the top time in the prelims of the men’s 1500 freestyle this morning, coming in with 14:24.39, well ahead of second-place Park Tae Hwan of South Korea in 14:30.14. Anton Ipsen of Denmark was close behind Park with 14:30.92, with Poland’s Wojciech Wojdak coming up third in 14:31.06. American True Sweetser will also be in the field tomorrow after a 14:34.05, along with Rio Olympic bronze medalist Gabriele Detti, also of Italy. Maybe swap Shields and Josa in back-fly for tonight. Tom just doesn’t seem to have his elite 50 fly speed, which is surprising, given his free and back splits this meet. 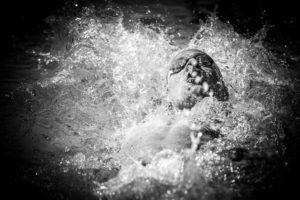 Shields set a new American record yesterday in the 50 fly semifinals in 22.38. You’re harsh. He did just the job to qualify his team this morning. No need of going faster in prelims. He had the 50 fly final of tonight in mind. A weak American record in the SCM 50 fly? What’s your time BIGLY? I know the time is faster than I could go. 26.8. But I’m almost 59. What’s yours? Wow, this whole exchange is just… wow. 25.9 – i am 49 – and than ? And then it just gets worse every year. Congratulate yourself on being past. Age adds a whole new dimension to racing. Never know when the piano hits if it’s actually time to meet your maker. I have a question to you Bigly . Is this word meant to be big league but trendied down ? I don’t think I can use it but I like to know my americanese . I’m already up on T Rex for SOS . HaHa Chiang Kai Shek invasion of Formosa vs Mao’s Tibet & The Art of War & Trump . This I gotta see. Someone must have been asleep last night when Tom Shields set a new American record last night in the 50 SCM fly. And he’s the number one seed in tonight’s final? See below. It was a new American record for a weak record. He’s not swimming his best fly right now, IMO. He was 4/10’s off his best time from Duel in the Pool in the 100 fly. I’m sure he was disappointed he didn’t break 49 and didn’t come within a body length of LeClos. In contrast to his slower 100 fly here, he did his best SCY 100 fly BY A LOT last weekend. I think he missed his best fly speed by a week. That’s what I meant by not having his elite speed. Rowdy Gaines or Brittany MacLean? Your thoughts. Absolutely, Brittany. The first two days were a treat watching – but as soon as Rowdy and the commercials showed up, I felt sick to my stomach. MacLean. just to change it up. Brittany well prepared and clearly knows a lot but doesn’t seem to be having much fun. Rowdy’s great for first part of any meet but seems to get bored as it drags on. I prefer Brittany for everything but the finishes. For the finishes, there’s no one better than Rowdy at missing the winner, and that, in itself, is worth the entertainment value. The classic was NCAAs in the 1650, when he thought the guy from Penn who ran down the leader to win the race was getting lapped. The 50 free with Puts winning was about the same. Morozov doesn’t make it through the heats. based his base on how fast everyone else was going, and it was slow, so he went slow.